It's important to differentiate between science and engineering. The Next Generation Science Standards work hard to distinguish between these two, but with previous state standards this wasn't always the case. For a long time, if you were to walk into a science classroom, you would typically see students with science books in front of them, and they would be learning about the facts of, say, what a rock is, what a mineral is, the difference between sedimentary and igneous rock, and so on. Step into a biology class and you'd see students learning about ATP, what ATP stands for (adenosine triphosphate), and how it functions in the body. In a chemistry classroom, students would be learning about different types of molecular bonds: covalent, ionic, metallic, hydrogen. All of this learning would be very textbook-based and very focused on the facts. That's the role science has played in the classroom for a long, long time. On the other hand, people often look at an engineering class and assume, "That's where students build things." A tech workshop class is where students cut wood and build birdhouses, right? It sounds like we might be making light of what occurs in these classrooms, but that's not the intent; in fact, we're making a very important point, which is that engineering has become largely pigeonholed to mean building things to previously specified standards. These examples may or may not fit with your personal understanding of what science and engineering are, but the stereotypes are nevertheless quite common. Under the Next Generation Science Standards, that changes. Now we have a very specific picture of what each is and does—and precise definitions of how each are very different from one another. The problem with the traditional stereotypes and their associated instructional methods is that scientists don't set out to learn every facet of what other scientists have done. They don't try to internalize all encyclopedic knowledge. They aren't trying to be an encyclopedia. What scientists do is ask questions, and they answer those questions by planning experiments. This requires extending what they know and conservatively searching for facts relevant to their question to inform their hypothesis. They then carry out an experiment, gather data and reflect on the hypothetical answer to the question they are testing. That's how scientists go from a question to a hypothesis to developing experiments to testing that hypothesis through the experiment. It is through their experiment that they gather data, which allows them to analyze and evaluate what the answer to their question is. That's where conclusions come in—real, evidence-based conclusions—which is how scientists give us new knowledge from experimentation. With some modification this is where the claim-evidence-reasoning (CER) model fits in, right there at the end while forming conclusions. As for engineers, they don't necessarily build anything as part of the engineering design process. The stereotype can be quite misleading, in fact. Construction workers build things, for example, but they don't engineer anything. Engineers, on the other hand, don't always produce something physical. You can't touch a computer program, yet they are engineered. Processes in factories to ensure quality control and prevent cross-contamination are engineered, but you can't touch a process either. Neither is tangible. Instead, we should think of engineering as being a process of identifying problems and then solving those problems by looking at the available resources, considering different approaches to the issue, and then developing a targeted prototype that is tested and yields data about its ability to solve the problem. Let's back up a second here and apply this directly to teaching in the classroom. If we use the definition of engineering as building something, that immediately eliminates the nonphysical forms of engineering like software engineering and financial engineering, which is teaching a misconception. We must avoid this, because engineered solutions can absolutely be nonphysical. Also, while construction workers build things, they are not engineers—rather, they rely upon the designs produced by engineers, who produce that design to solve a problem. Engineers are creators, not followers, and the same is true of scientists. What does this mean from the classroom from a curriculum perspective? It means that anything rote that children are following in terms of picture, make-by-diagrams, make-by-number and other similarly canned lessons are out of alignment with the true nature of next generation science and engineering right from the get-go. Writing a procedure on the board and having children copy it to the letter is a problem because students are not actually engaging as scientists or engineers. Copying and following does not engage students in the practices of science or engineering. To return to the subject of how to differentiate between science and engineering, we've said that scientists ask questions and develop hypotheses while engineers use that scientific knowledge to develop solutions to problems. More specifically, engineers solve problems by developing and testing prototypes. 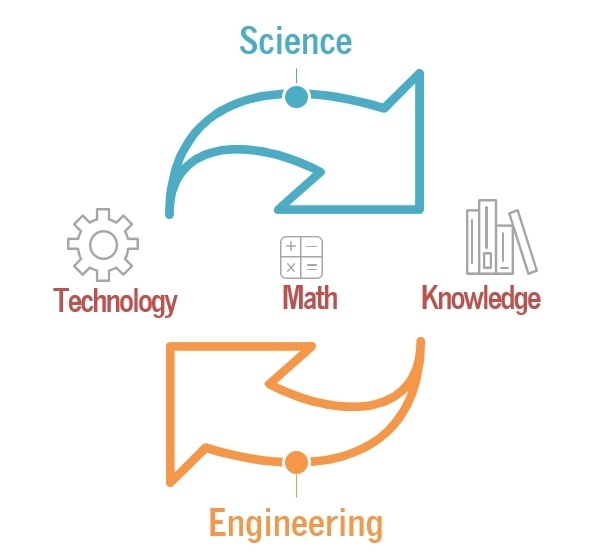 Science and engineering are key components of the STEM cycle, a cycle of innovation in which scientific knowledge provides engineers the basics to solve problems in new ways by prototyping new technology, which in turn helps extend science in to new areas. Mathematics serves as a tool for communication in all areas of the cycle, it is the means by which we can objectively quantify and analyze observations . The STEM cycle in the image above is a cycle of innovation. Technology enables scientists to become aware of new questions as well as answer those questions which they otherwise couldn't for lack of access to collect and analyze data. A good example of this is outer space. Currently we have a wealth of questions about outer space that we just can't answer because we don't yet have the proper technology. Engineers, however, are using their scientific knowledge to give us greater and greater access to the reaches of deep space by designing probes (technology) with ever-greater powers based. Math is at the center of the entire cycle because it is the tool for quantifying, analyzing, communicating and evaluating our observations. So while engineers and scientists have very different roles, they are irrevocably interrelated and connected. Each engages in different processes, but they use all same science and engineering practices.